Time to share something simple but tangible along with an unconventional twist and highly utilitarian character! You can find all these features in this rustic DIY pallet dresser, a functional rustic dainty piece of pallet furniture, constructed just by loading and stacking up of heavy duty pallets! 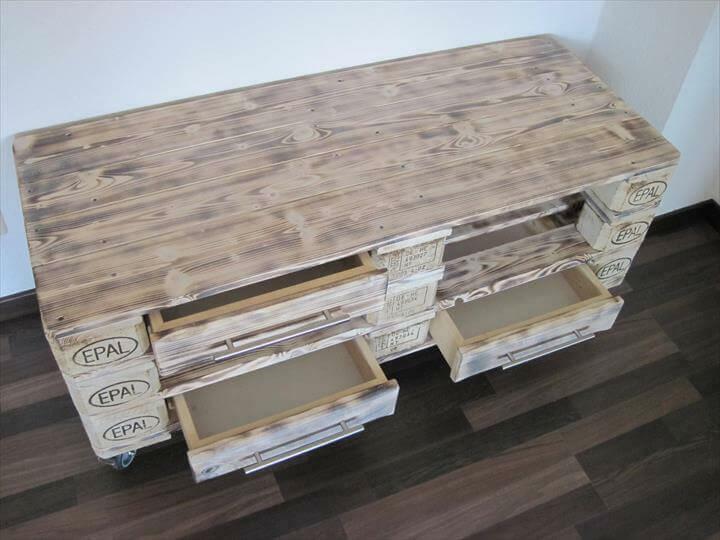 Rustic structure comes with 3 drawers and leads to functional front of this table, also provides an ample space to hide your tools and to secure you according items! 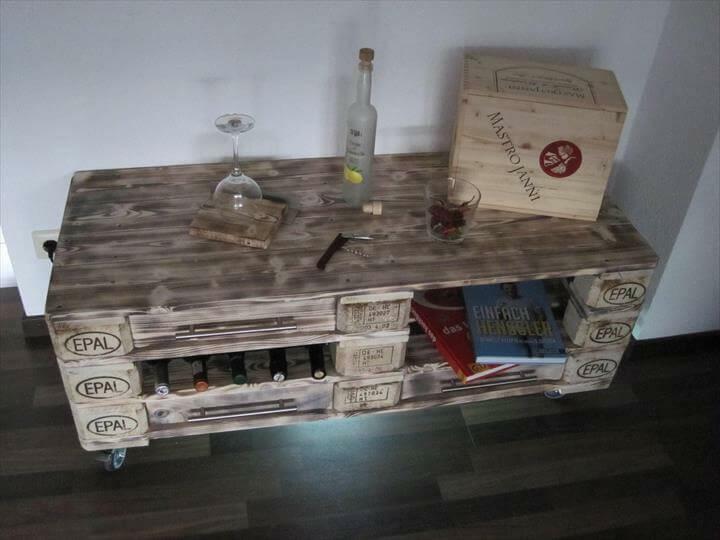 No modifications or any creative alterations are needed to get it changed into a coffee table or a highly functional DIY pallet media console table for your media and family rooms! There are multiple things and options that can be added and readjusted for a functional and visual boost! Enjoy a rustic touch in your modern chic interior which can go for bigger decor statements! You can even get the modern chic appearance of it by making clever use of paint, stain, varnish, wood oil or wood sealants! This would also provide you the finely finished wooden product with lasting longer stability! For finally smooth and effortless movement, hardware rolls have been fixed at the bottom as rolling legs! Load 3 of Euro pallet skids over one another and secure the opening and pockets with drawers to get a storage-friendly dresser with rustic statement of decor! Some hardware drawer pulls and metal wheels have been used for ease of drawer opening and rolling movement of table respectively! 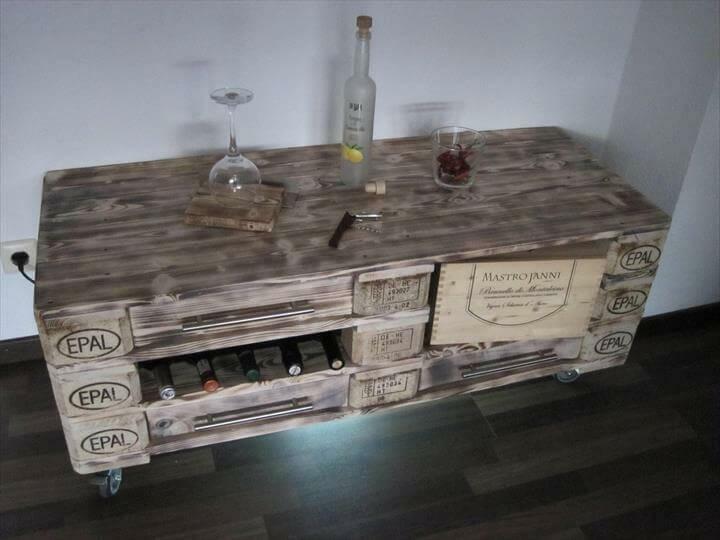 Rustic nature of pallet are gets beautified with hardware and meta touch! Table is a perfect dresser table but can be used as a coffee table in any of your modern chic or vintage inspired living room and also as a media console table in your family room!